It is not certain where exactly Copernicus resided during his stay in Kraków. Although according to university statutes students were obliged to stay in college accommodation, the future astronomer could have taken up private lodgings or stayed with his relatives. It is more than certain, however, that he attended lectures in three colleges, Collegium Maius, Collegium Minus and Collegium Juridicum which, though extensively remodelled have survived to the present times. The roof of the building attached to Collegium Maius from the south featured an astronomical observatory where Copernicus could have observed eclipses of the sun and of the moon in 1493-4. In 1494 Collegium Maius housed an exhibition of astronomical instruments used by Marcin Bylica of Olkusz (d. 1493), a former student of the university, a disciple of Regiomontanus (Johannes Müller) and later court astrologer to Matthias Corvinus, King of Hungary (d. 1490). Shortly before his death, Marcin Bylica bequeathed his astronomical instruments to the university. Transported from Hungary to Kraków by Stanislaus Bylica (nephew of the deceased), they aroused such interest that Jan Sacranus, the university rector, announced a day off (14 Oct) for visiting the exhibition. Carefully preserved, the instruments are the prize possession of the Jagiellonian University Museum, and valued especially by astronomers and researchers interested in the life and work of Copernicus. 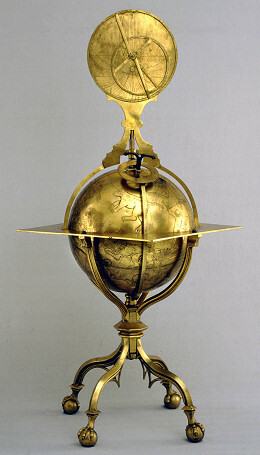 The most valuable astronomical instrument from the collection is the enormous armillary sphere purchased by Joannes Bylica from Hans Dorn in Vienna in 1480 and the torquetum, also made in Dorn’s workshop, designed to determine the ecliptic coordinates. Made of bronze around 1487 and featuring a magnetic needle pointing to the north, it was an essential late mediaeval astronomical instrument. 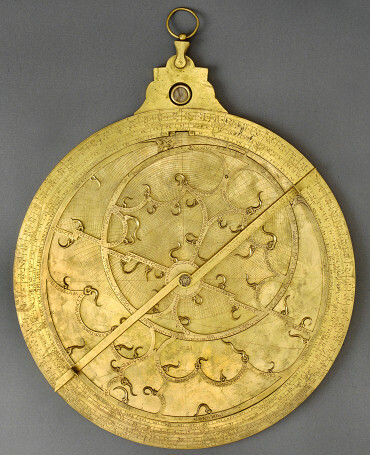 The collection also included two flat Arabic metal astrolabes which Bylica had used for determining the location of stars by measuring angles to them from known points. The former made in Cordoba in 1054 is one of the oldest scientific instruments found in Polish museum collections, while the latter was made in 1486 by Hans Dorn. While studying in Kraków Copernicus took an interest in other astronomical instruments and their design, and later, while residing in Warmia, he constructed a quadrant using fir as the construction material, an armillary sphere (astrolabe) and a triquetrum, which he then described in detail in his De revolutionibus. It is Copernicus’ disciple Georg Joachim Rheticus who deserves most praise for not letting the name of his mentor be forgotten by posterity. While staying in Kraków in 1554–74 he put up an obelisk meant for astronomical observations in the ‘heretics’ garden’ (probably in Wesoła Street not far from the present Copernicus Street). The obelisk was later demolished, most probably in 1574. Joannes Broscius (Jan Brożek, 1585-1652), a Kraków professor of astronomy, was another great admirer of Copernicus; he even planned to write a biography of the great astronomer, although he never did. Looking for memorabilia, he even made a trip to Warmia in 1618 and brought some letters and other documents back to Kraków (which later mysteriously disappeared). Ca 1620 Brożek printed a memorial wood engraving Nicolai Copernici Epitaphium and published in 1629 Septem Sidera (Seven Stars), a poem undeservedly attributed to Copernicus. A small brochure titled Epistolae published in the Piotrowczyk printing shop in 1615 included a hexameter quoting the following words allegedly said by Copernicus: ‘Toruń gave me birth, Kraków made me master while beautiful Warmia considers me one of its leading figures’ (Me genuit Torunia, Cracovia me arte polivit - Inter habet primos Varmia clara patres). The museum collection of the Astronomical Observatory in Kraków includes a most valuable original copy of the first edition of De revolutionibus with Brożek’s handwritten remarks which refer to its altered title and the bogus foreword. The cult of Copernicus grew stronger, especially during the Enlightenment, fostered by the growing acceptance of the heliocentric theory so ardently expressed by many. These included Jan Śniadecki (1756-1830) who delivered A Eulogy for Nicolaus Copernicus (Pochwała Mikołaja Kopernika) at the public inaugural session of the Kraków Academy in 1782 and later in 1802 published a study About Copernicus (O Koperniku) targeted at the general public. On the occasion, in 1873, of the approaching 400th anniversary of Copernicus’ birth some memorabilia once belonging to the private collection of Izabella Czartoryska, first displayed in Puławy and then in the Hotel Lambert in Paris, were sent to Kraków. The collection included a funerary urn allegedly with the ashes of the great astronomer, some letters and other documents, and a collection of printed portraits. 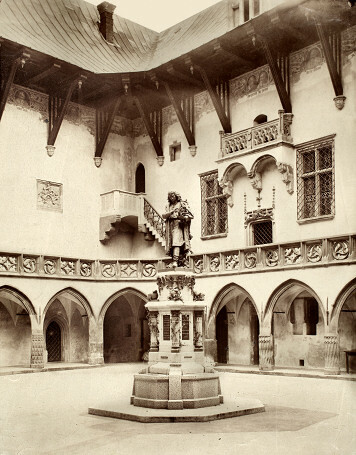 The lobby of the Kraków Academy of Learning (Akademia Umiejętności) featured a statue sculpted by Walery Gadomski (1833-1911) funded by Adam Potocki. Also for this occasion Jan Matejko painted a large picture of the astronomer at the moment of his great discovery. The unveiling of this masterpiece was the highlight of the jubilee celebration. The painting was later moved to the main auditorium of the Collegium Novum in 1886. Deemed less noteworthy, the statue sculpted by Cyprian Godebski (1835-1909), originally displayed in the courtyard of Collegium Maius, was moved in 1952 to the Planty city park near to the Collegium Historicum. The most valuable Copernican relic remaining in Kraków is the original manuscript of De revolutionibus, a prize item in the manuscript collection of the Jagiellonian Library and since 1956 bearing the library number BJ 10 000.